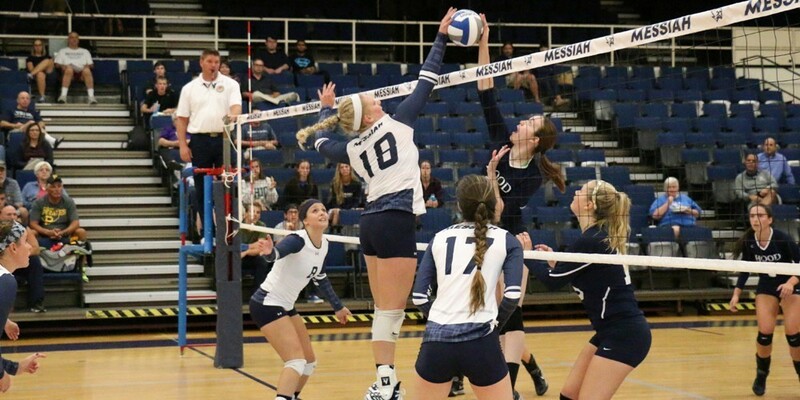 Every year, Judi Tobias, the Messiah women’s volleyball coach, has sat down with the upcoming season schedule, marking it up with W’s and L’s—where she thinks the team will pull out a win, and where she might anticipate a loss. But this year, she broke the tradition—and is glad for it. Out of any year, it would seem tempting for Tobias to try to predict an outcome, with a 26-8 finish last year and all but four players returning from 2014—including seven starters. Despite some apprehension—Tobias references, “the definition of insanity as doing things over and over again excepting different results”—three weeks into the 2015 season the Falcons remain undefeated, despite a tough first set against Hood on Wednesday. “It’s about growing. We do have a lot of the same physical people, but we are definitely more mature, and that makes a big difference,”Tobias says. 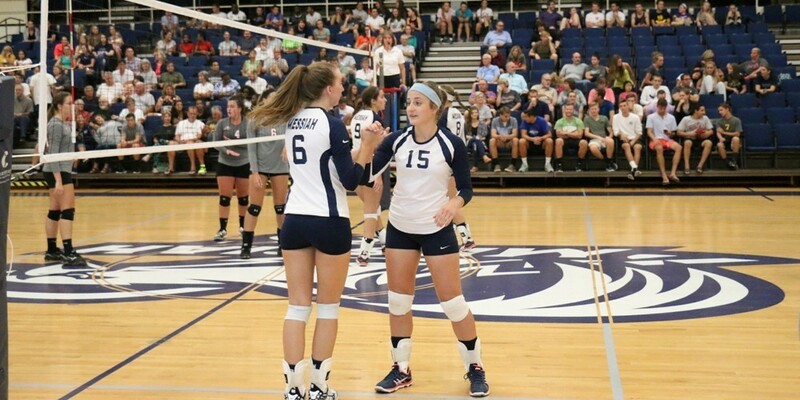 Take, for example, junior outside hitter Kristen Douglas. She was named MAC Commonwealth Player of the Week last week after totaling 59 kills and 46 digs. Her current average of 3.91 kills per set is a noticeable jump over last year’s total where she averaged 3.14 per set. With new players contributing to defense on the court, Tobias hopes to keep working on stressing the fundamentals of returning serves and hitting a target. “Even when you’re playing well, there’s things to improve on…the list never ends. It’s not like I’m teaching them how to put their hands together, it’s about getting (the ball) to a perfect spot,” Tobias says. In the meantime, the team has certainly showed resiliency—particularly in the Battlefield Classic final against Penn State Altoona. The Falcons dropped the fourth set 22-25, but instead of withering under the pressure, responded strongly in the fifth set and took a dominant 15-6 win. The Falcons have played a fairly balanced schedule so far, but a true test will come this upcoming week as they face an away match with Stevenson, who is currently right behind Messiah at second in the MAC Commonwealth with a 9-2 record. For now, the Falcons hope to continue to use their familiarity with one another to stay atop the conference. The Falcons will return home to face Alvernia on Sept. 29 at 7 p.m.